2 Syed Abdul Jabbar PhD "Stories in State of Kuwait"
3 Ali bin Ali bin Mohammed Al-Jalal PhD "Structuring the Negative Verbal Sentence in the Poetry of Abdullah Baradom – A Syntactical and Signific Study"
4 Mr. Md. Raizuddin Alom PhD "Contribution of Laila Al-Othman to the Enrichment of Arabic Short Story in the State of Kuwait"
5 Mr. Haroon Rasheed S.M. PhD "The Concept of Man in Writings of Jubran Khalil Jubran and Rabindranath Tagore: A Comparative Study"
6 Mr. Mohd. Shamsuddin PhD "Development of Short Story in Arabian Gulf"
7 Mr. Hafiz Hamed bin Mohammed Qureshi PhD "Contribution of Dr. Abdullah Al-Qatam in Development of Essay Writing in the Arabian Gulf"
8 Mr. K.Sheikh Ibrahim Oli PhD "The Role of Sheikh Abdul Aziz Al-Babteen in Spreading Arabic Poetry and Culture"
9 Mr. Syed Mujahed-Ul-Hashmi PhD "A Critical Study on the Poetic Works of Sou’ad Mohammed al-Sabah"
10 Mr. Mohd. Arif PhD "The Language in the Stories of Sulaiman Al-Shatti"
11 Mr. Muathasim Billah T.P. PhD "A Critical Study of Muhammed Musaed Assalih’s Essays"
12 Mr. Shaik Abdul Lateef PhD "Ahmed Musharee al Advani and his Contribution to Modern Arabic Poetry"
13 Mr. Hanlalath K.V. PhD "Love and Pang in the Poetry of Fahad Al-Askar"
14 Mr. Ali Ali Md. Al-Galal PhD "Structuring the Negative Verbal Sentence in the Poetry of Abdulla Al-Baradoni: A Syntactical and Significant Study"
15 Mr. Mohd. Maqdoom Ahmed Mashoqi PhD "The Patriotic Trends in Egyptian Arabic Poetry during the First Half of 20th Century"
16 Mr. Abdur Raheem M.A. PhD "A Critical Study of the Syllabus of Arabic Grammar in Government and Private Educational Institutions in the State of Tamil Nadu and its Methods of Teaching: Proposed Solutions"
17 Mr. Muhammad Kamran Azeez PhD "Development of Essay Literature in Arabian Gulf with Special Reference to Iraqi Invasion to State of Kuwait"
18 Mr. Mohammed Iqbal M.K. PhD "Development of Essay Literature in the State of Kuwait"
19 Mr. Mohd. Fysel M.P. PhD "Development of Arabic Poetry in Kuwait"
20 Mr. Mohammed Kaleemuddin PhD "Time, Space and Environment in Kuwait’s Literature"
21 Mr. Mohammed Shakir Raza PhD "Descriptive and Comparative Study of the Arabic Novel ‘Salwa Fi Mahabel Rih’ and the Urdu ‘Umrao Jan Ada’"
22 Mr. A. Abdul Hakeem PhD "Literary Wondrous Nature of Holy Quran Revealed by Mustafa Sadia – Reference as Depicted"
23 Mr. Syed Abdul Jabbar MPhil "Conceptualization of a Pedagogical Framework for a New Curriculum for Teaching of Arabic (Language) at Under Graduate Level in Karnataka (India)"
24 Mr. Haroon Rasheed MPhil "Jubran’s Social Philosophy"
25 Mr. Hafiz Hamed Bin Mohd. Qureshi MPhil "Development of Modern Poetry in Arab Republic of Yemen in the Second half of 20th Century"
26 Mr. Syed Mohd. Zahurul Haque Hussaini MPhil "A Comparative Study of Tafseer Al-Manar of Rasheed Raza and Fizilalul Qur’an of Syed Qutub"
27 Mr. Mohd. Shamsuddin MPhil "Development of Short Story in the Kingdom of Saudi Arabia"
28 Ms. Fathima Tabassum MPhil "Ibn-e-Qutaiba: His Life and Works"
29 Mr. K. Sheikh Ibrahim Oli MPhil "Prominent Features of Writing of Moulana Abul Hasan Ali Nadwi"
30 Mr. Mujahed-Ul-Hashmi MPhil "Yaqub Al-Rashaid and his Contribution to enrich Arabic Poetry"
31 Mr. Shaik Abdul Lateef MPhil "Prince Abdulla-al-Faisal as a Poet"
32 Mr. Muathasim Billah T.P. MPhil "Abdullah Malabari: A Short Story Writer"
33 Mr. Hanlalath K.V. MPhil "Abdul Aziz Al-Surayi and the Drama in Kuwait"
34 Mr. Md. Abul Kalam Choudhury MPhil "Contribution of Fatima Yousuf Al Ali in Enrichment of Short Story in the State of Kuwait"
35 Mr. Syed Iftekharuddin Ubaid MPhil "Muna Al-Shafei and his Stories"
36 Mr. Aziz Ur Rahman MPhil "Al-Manhal Magazine and Its Contributions to the Development and Spreading of Arabic Literature"
37 Mr. Shamsudheen E.K. MPhil "Nationalism and Patriotism in the Poetry of Mohammad Ahmed Khalid Al-Mashari"
38 Mr. Syed Ifteqar Hussain MPhil "Contribution of Khalid Saud Az-zaid in the Enrichment of Modern Kuwaiti Poetry"
39 Mr. Abdur Raheem M.A. MPhil "The Modernism in the Poetry of Khalifa-Al-Waqian"
40 Mr. Sajjad Ahmad Bhat MPhil "Arab Nationalism in the Poetry of Ahmed As-Saqqaf"
41 Mr. Mirza Abdul Raheem Baig MPhil "Nationalism in the Stories of Thariyya al-Baqsimi"
42 Mr. Mohd. Thasleem M.M. MPhil "Milieu and Place in the Poetry of Mohammed Al-Fayiz"
43 Mr. Mohammed Kaleemuddin MPhil "Space and Milieu as Seen by Hamad Al-Hamad"
44 Mr. Muhammed Niyas C.K. 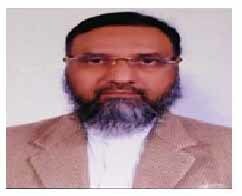 MPhil "Semantic Approach of Syed Qutb in his Tafseer ‘Fi Zilalil Qur’an’"
45 Mr. Mohd. Amin Tantry MPhil "War and Peace in the Writings of Lalila al Osman"
46 Mr. Mohammed Fysel M.P. MPhil "A Comparative Study between Kasida of Al-Imam Al-Busiri and Kasida Khadirya by Shaik Abdul Kadir Musliyar"
47 Mr. Sameer C.T. MPhil "Gender Issues in Taha Hussain’s Novels"
48 Mr. Mohammad Shakir Raza MPhil "Technical Features in the Poetry of Abdullah Al-Otaibi"
49 Mr. Md. Nayeemuddin MPhil "The Impact of Human Sciences on Arabic Literary Criticism"
50 Mr. Saithalavi K. MPhil "Social Aspects as Depicted in Saudi Short Stories"
51 Mr. Shaik Osman Bin Ahmed Ba Samad Al-Amoodi MPhil "Contribution of Al-Maahad al Dini al Arabi to Arabic Language and Literature"
52 Mr. Abdul Gafoor K.A. MPhil "Nationalism in Kuwaiti Poetry"
1 Mr. Sufyan Abdul Sathar Moozhikkal Ph D "11th September as Depicted in Saudi Arabia Novel"
2 Mr. Mirza Abdul Raheem Baig Ph D "Contribution of Prof. Moinuddin Azmi to Arabic Language and Literature"
3 Mr. Mohd. Rafeeq Uddin Ph D "Social Issues in Kuwaiti Novel"